Yesterday, September 24, the University of Missouri took a step in the right direction when they announced they would withdraw the "refer and follow" privileges from abortionist Colleen McNicholas beginning December 1, 2015. We commend the University for this step. However, there are still major concerns. First, why the delay? How many babies will lose their lives between now and December 1? If you are going to withdraw privileges, why not now? Second, will the University offer more privileges in December? Will they offer privileges to another abortionist? There are many unanswered questions at this time. We thank Senator Kurt Schaefer and the Senate Sanctity of Life Committee members as well as the House Ways and Means and Children and Families Committees for the progress we are making and we encourage them to continue their investigations. We recommend pro-lifers keep up the pressure. And continue to ask MU to stop enabling the abortion business immediately! There are babies to save today! Last week the US House voted 241-187 (1 present) to de-fund Planned Parenthood (HR 3134) and 248-177 (1 present) to protect Born-Alive Abortion Survivors (HR 3504). Below are the votes for our Missouri U.S. Representatives Congressional Delegation. We thank Senator Roy Blunt for his defense of life on the Senate floor this week during debate on the Pain-Capable Unborn Child Protection Act. Sadly the Senate failed to get the 60 votes needed to pass the bill. Final count: 54-42 with MO Senators Roy Blunt voting in favor of the bill and Claire McCaskill voting against. They say it's not a baby, but I think when you look at Micah's picture when he was 22 weeks...maybe that will help people see him in a different light they didn't before...read more. 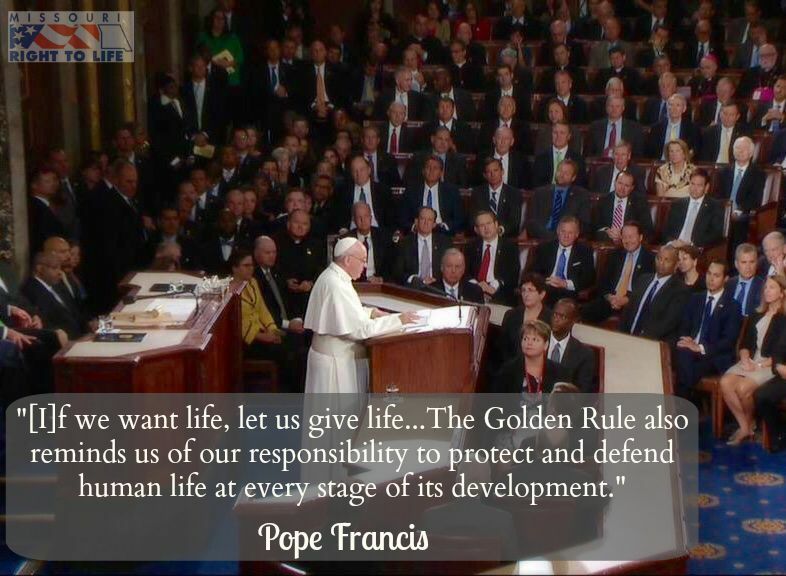 Pope Francis Urges Respect for Life in U.S. In his first speech on American soil, Pope Francis praised America's Roman Catholic church for its "unfailing commitment" to the pro-life cause, saying it was "the primary reason" for his visit to the country...read more. Later he gave an historic address to a joint session of Congress and called on lawmakers to protect life...read more. The stem cell wars are far from over. How some "donated" aborted baby parts are being used...read more. October 1 - Jefferson City - Organizational meeting for the new Jefferson City Chapter of Missouri Right to Life. Jefferson City Church of the Nazarene, Fellowship Hall. 7:00 - 8:00 pm. Featured Speaker, Former State Senator Larry Rohrbach. October 10 - St. Louis - National Day of Protest at Planned Parenthood 10 am - 12 pm, 4251 Forest Park Blvd.